The last news I had on OLLA’s and ALGE’s nest was that the nest was empty and I spotted BABY in a tree. I’ve now spotted YAYN as well, with ALGE keeping watch on her; and I’m 90% sure that I saw three fledglings, although I couldn’t see all of their bands. So it looks very likely that all three chicks fledged and are doing well. The nest with four eggs in it that I mentioned previously is, one month later, still four eggs. The parents have abandoned it; the eggs are cold to the touch (i.e., not being incubated). This nesting attempt has failed. Since I saw the female incubating over a long enough period to think that she didn’t abandon the nest before the eggs should have hatched, I suspect that the eggs were infertile. I’ve also found two new nests! Both belonging to unbanded parents, unfortunately, so let’s call them nest #1 and nest #2. 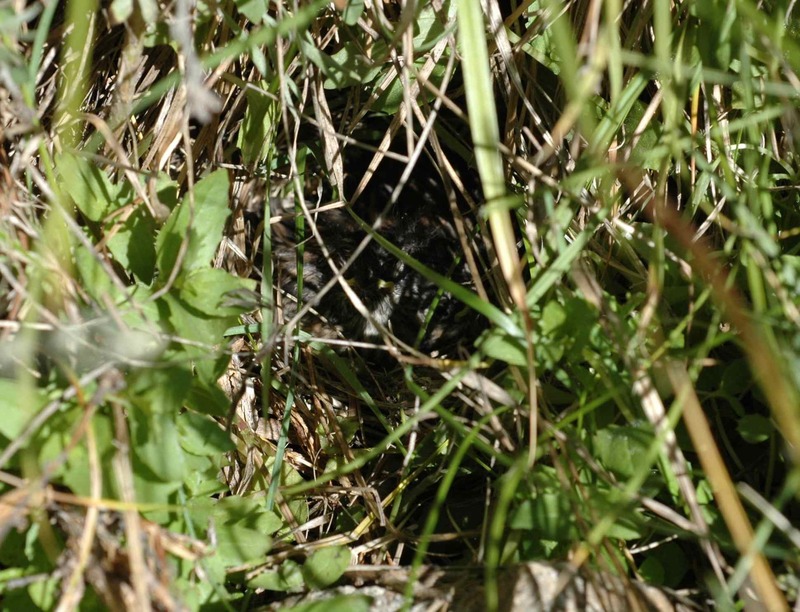 Nest #1 was found when, during mist netting, a junco skittered along the ground bare feet from us. “Whoa,” I said. My dad pointed out where the junco had flown from, and sure enough, there was her hidden nest, with the four tiny nestlings she had been brooding when my dad flushed her. One parent heading for nest #1 – that dark cave under the rock. Photo by M. LaBarbera. 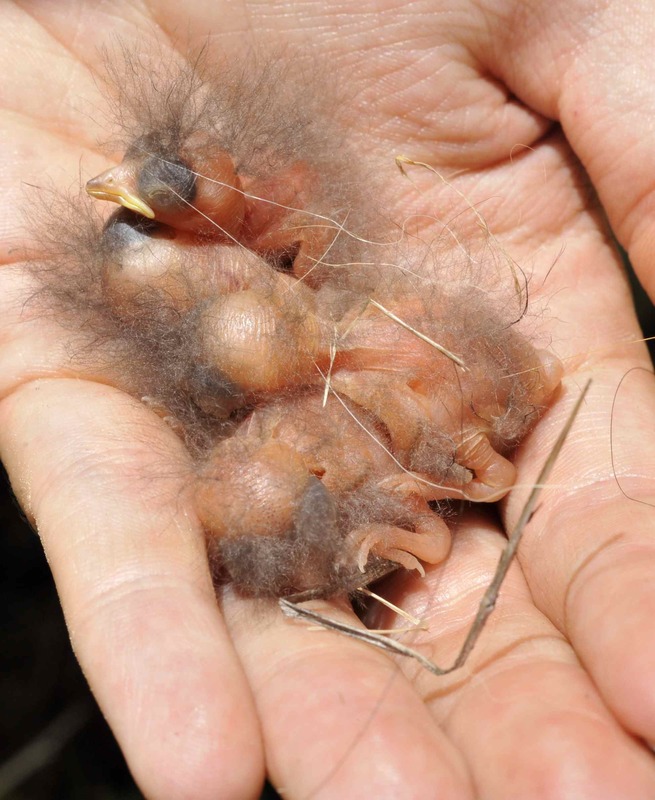 Four nestlings from nest #1. Photo by M. LaBarbera. 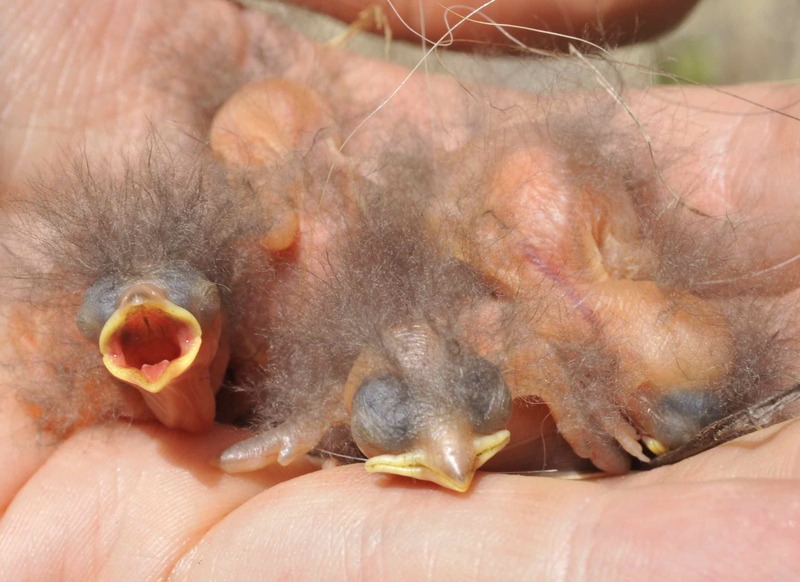 These chicks are very young—more grubs than birds. (I actually think they’re adorable, but I know not everyone will agree.) They can’t stand up, or open their eyes, or keep themselves warm. The only things they can do are beg for food and digest. They’re basically tiny, pink, slightly fuzzy digestive systems. 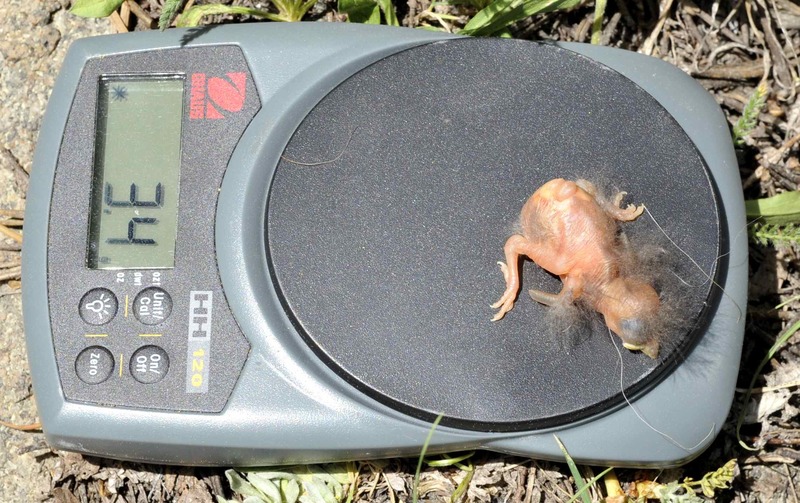 This chick weighed 3.3 grams. Photo by M. LaBarbera. 3.4 grams. Photo by M. LaBarbera. 3.2 grams. Photo by M. LaBarbera. 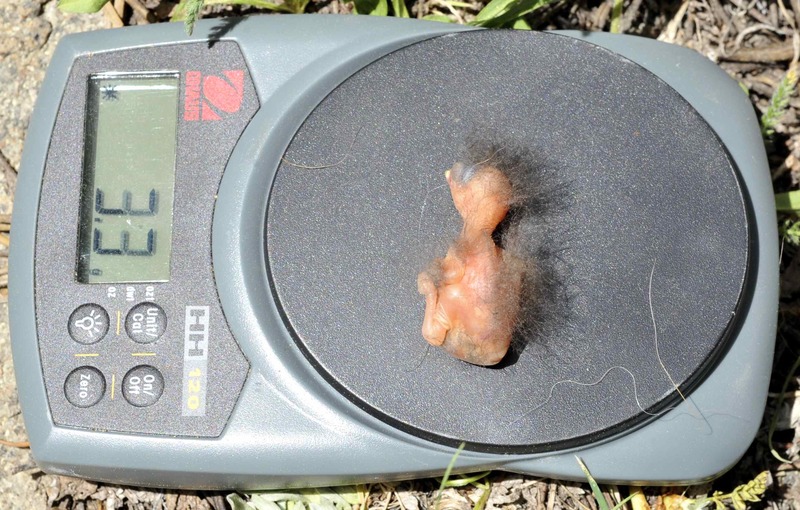 2.1 grams – runt! Photo by M. LaBarbera. I estimate that the three larger chicks all hatched the day prior to these pictures being taken, and that the smallest one hatched on that very day. Three days later—the last day of that trip—we returned in hopes of banding the chicks, but unfortunately their legs were still too small: if I had banded them, the bands might have slipped down over their feet, holding them closed. You can’t see me if I hide my head… Two of the larger chicks, probably five days old. Photo by M. LaBarbera. The third larger chick (right) and the runt. Note how the larger chick has more pinfeathers. Photo by M. LaBarbera. By the time I was able to visit the nest again, ten days later, the nest was empty. They had probably fledged days before. I’ve been trying to catch them as fledglings near the nest, but so far, no luck. Unfortunately even if I catch a fledgling in that area, I won’t be sure that it is one of them. 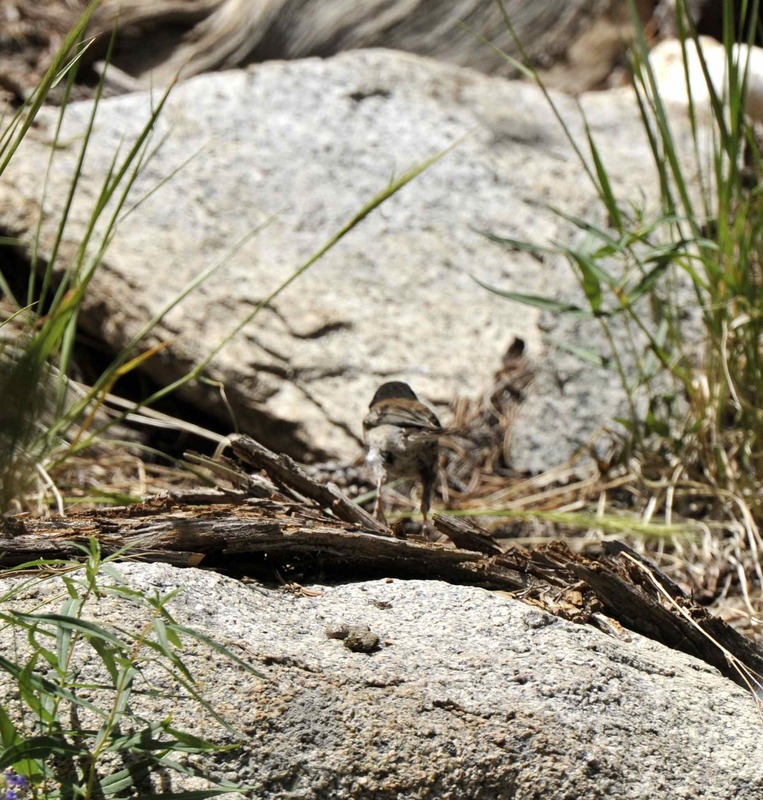 We found nest #2 when I noticed a junco scolding a hiker’s dog in the parking lot at one of our sites. I watched, and when the dog went away, the junco flew down into the brush in a small ravine at the edge of the parking lot. I approached to flush him, and there was the nest. Find the chicks… (hint: look for the yellow of the bill). 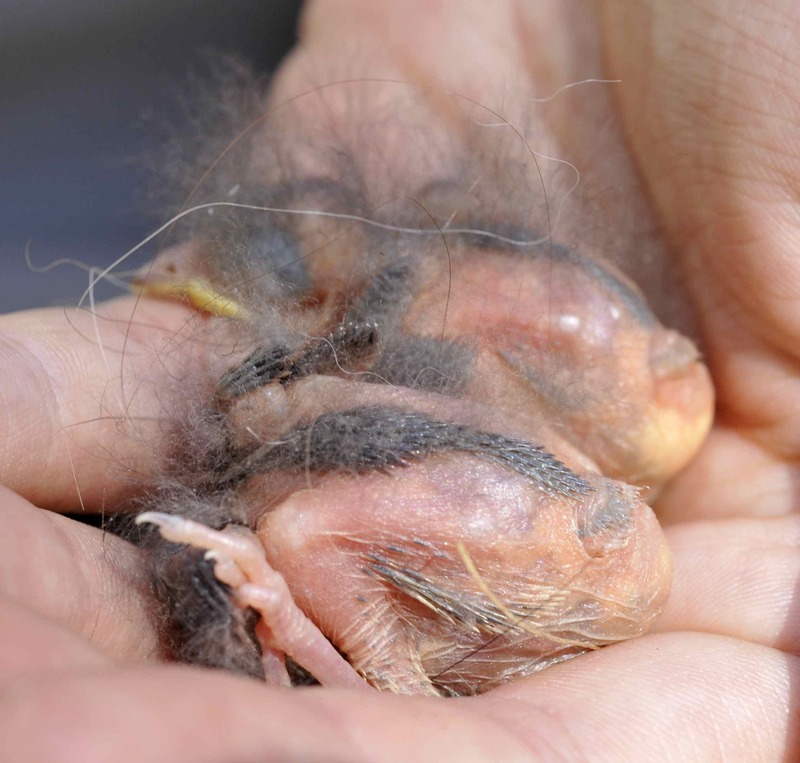 There were two nestlings, probably eight or nine days old, and one unhatched egg. This egg was definitely infertile, since clearly the others were incubated correctly. 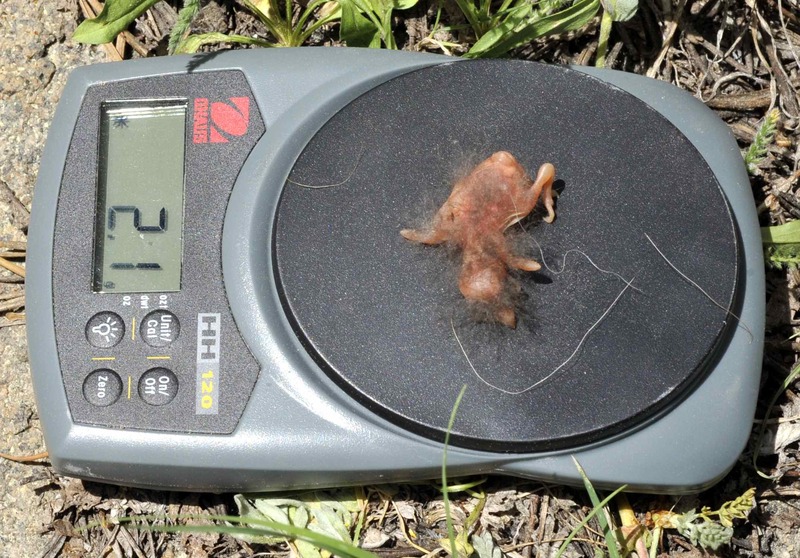 This means that, out of four nests, potentially two had issues with infertility—that’s high enough that you would expect it to be a selective pressure on females, to which they might respond by trying to select the most fertile mates, or by mating with multiple males. 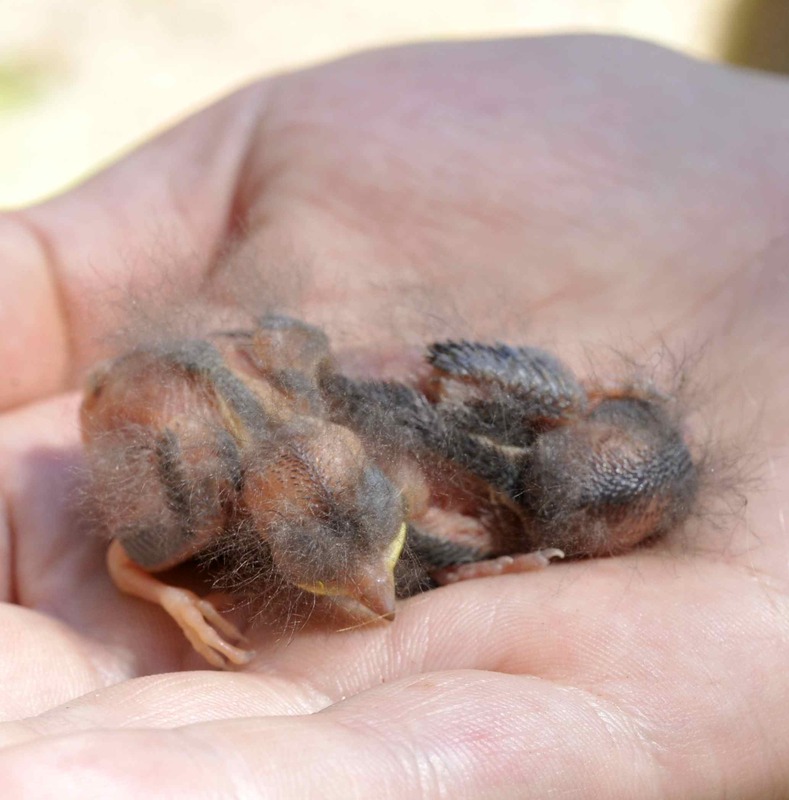 These nestlings were big enough to process, so we banded them YOGA and RARR. Like OLLA’s and ALGE’s nestlings, they were very feisty, constantly trying to escape from us. We hurried to get them back into the nest so that they (and their parents) could calm down. RARR got very puffy, although it wasn’t cold out. This may be a stress response. The chicks did not want to stay in the nest after we put them back, especially YOGA. When we checked on them a few hours later we found that they had moved from the nest to some brush about a foot away, also in the ravine. I would prefer that my interfering with chicks have no consequences at all; but since their parents were feeding them there, and the chicks were entirely concealed, I think this should be fine. Chicks of this age can walk and perch, so whether they’re in a nest or not doesn’t matter, as long as they’re hidden and the parents know where they are. If the parents wanted them back in the nest, they would herd them back. By now YOGA and RARR should have fledged. I hope that I’ll see them on the next trip! 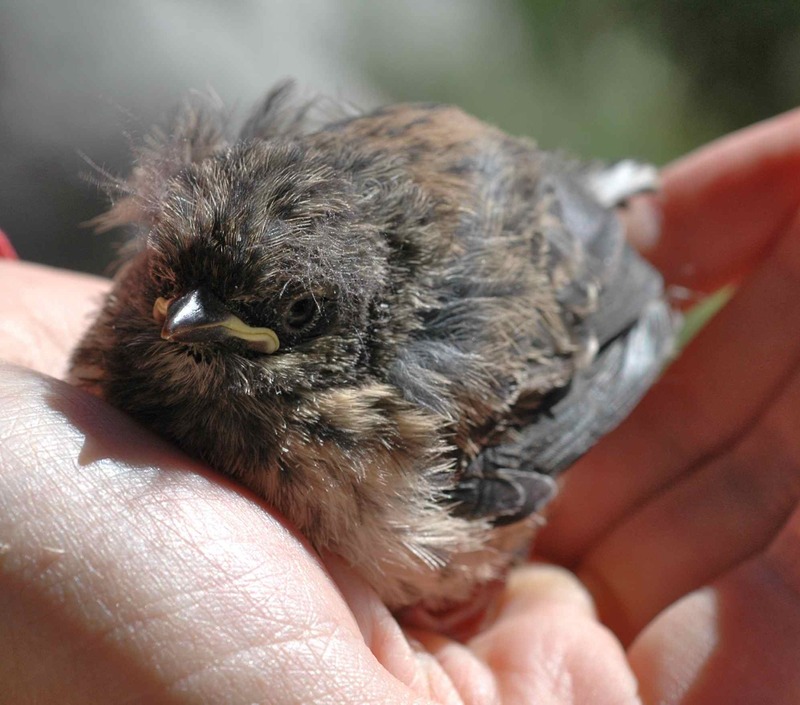 This entry was posted in DEJU, field work, notable juncos and tagged ALGE, birds, Dark-eyed Junco, eggs, fledglings, nest, nestlings, OLLA, RARR, YAYN, YOGA by toughlittlebirds. Bookmark the permalink. How…amazing. You are so lucky to hold them in your hand! 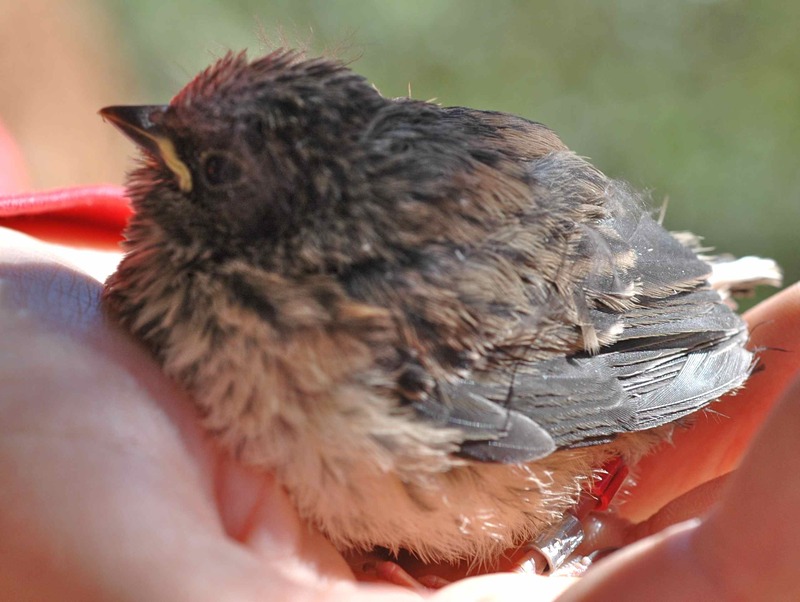 Hi, thanks for your comment and thanks for thinking of the welfare of the juncos! 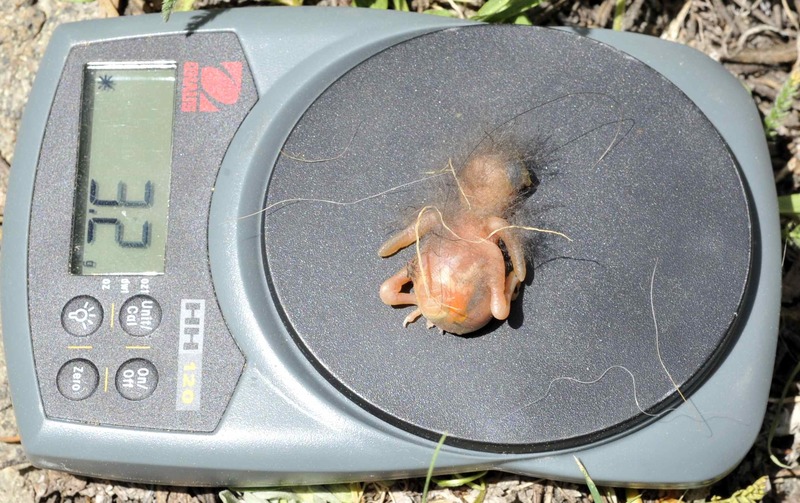 If any chicks survived, it will take a while for them to get old enough to be safe; they may not leave the nest until they’re 9-14 days old, and when they do leave, they’ll still be flightless and clumsy (and vulnerable) for a while. The longer you can keep the cat in, the better their chances will be.